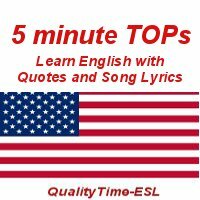 Here is a new "TOP" to help you understand spoken English through "Training with Oral Practice" based on quotes and song lyrics. We are including more musical excerpts in our new episodes. This episode is based on one of my very favorite songs. Click on the icon below to get the recording or go to the iTunes store to subscribe. If you wish to quickly access all four of our FREE series, just type "Marianne Raynaud" in the search window of the iTunes store. If you want to go on, TOP 22 is coming up soon. If you are looking for effective teaching materials, read about QualityTime-ESL: The Digital Resource Book Version on a DVD or a lighter downloadable version, which includes most of the scripts and worksheets of our different series plus 1,500 other files (MS Word, MP3, PPT and video). To purchase it for €29 plus shipping according to the destination, just go to the store. Downloadable version for €14.99.